Size: Metal head scraper: approx. 195 x 32mm / 7.68" x 1.26"
Plastic scraper: approx. 190 x 35mm / 7.48" x 1.38"
Sealant finisher: approx. 160 x 43mm / 6.30" x 1.69"
Use with the tool,saves half time to remove the dried caulk. NO WASTE of sealant,excess sealant could be saved on silicone pad. Made of Premium Silicone, Stainless Steel Material, This Tool Kit is Environmental-Friendly and Durable. This kit includes a plastic scraper, a metal head scraper and a sealant finisher. Durable and no thorns,wearproof and solvent-resistance. Wide use: Apply to kitchen bathroom fitter sink, DIY works or floor silicone sealant sealing; Works with most types of sealant, silicone, acrylic, resin, grout and more. 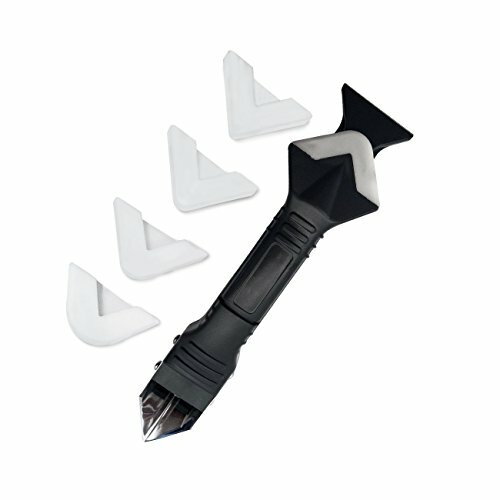 3 IN 1 Caulk Tool which is enough for removing old caulk and replacing a new caulk. If you have any questions about this product by ERESMISOL, contact us by completing and submitting the form below. If you are looking for a specif part number, please include it with your message.